The 2010 season is approaching and I have decided to update the facilities on my campsite. Firstly we had to clear away an old elevator, which was at least 70 years old and pull it to another field. I couldn’t bring myself to get rid of it completely – a piece of agricultural archaeology! The site is being cleared for the new season so we had to demolish an old mobile home which had been on the site for at least 40 years. 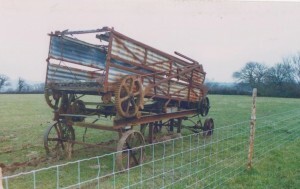 This took place a few weekends ago when a local contractor took it apart to get all the aluminium off it to leave a pile of wood. Previous to this we had to clear out all the stuff from the inside which seemed to take hours. It was amazing how much rubbish there was. We nearly filled up a skip with the non burnable items. We had to find more rubbish to put into the skip to fill it up to the maximum level to justify the money it has cost to hire it. Several weeks ago we had some road plainings delivered. So far we have made another 2 hard standings on the campsite. We put the first one in last November for a short winter let. After digging out the soil ready for the hard standing it is necessary to put down a layer of plastic to give it a firmer base and to stop weeds growing up through the plainings. The road plainings are then put on top and rolled in. The snowdrops have been spectacular this year and are all round the river banks and down the road side verge. 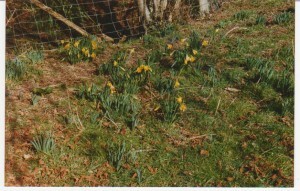 Daffodils are just coming out in the orchard and should be a carpet of colour in a week or so. The catkins are also blooming in the orchard. The sheep are due to lamb in a few weeks. It all sounds very exciting and we are looking forward to coming tomorrow!!! After a few days at an acceptable, but not brill site in S. Devon, really looking forward to doing a bit of exploring of the Dorset coast. Just returned from this lovely peaceful campsite….what a treasure! no screaming children…just countryside. Thankyou for a lovely stay, just chilled for four days!! !